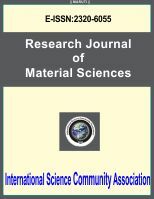 International Science Community Association are publishing an international peer reviewed journal Research Journal of Material Sciences. It is the vision of International Science Community Association to publish research papers, research articles, review papers, mini review, case study and short commutations in all areas of human study without financial restriction. Coverage Area: Researches in the field of Material Sciences which including metals, ceramics, glasses, polymers, fibers, nano-materials and nanostructure materials, their structure and properties i.e., mechanical, chemical, electrical, magnetic, optical, thermodynamics, kinetics and mechanisms, biological and biomedical materials, solid state materials, x-ray crystallography, molecular modelling and advances material engineering, etc.